4. 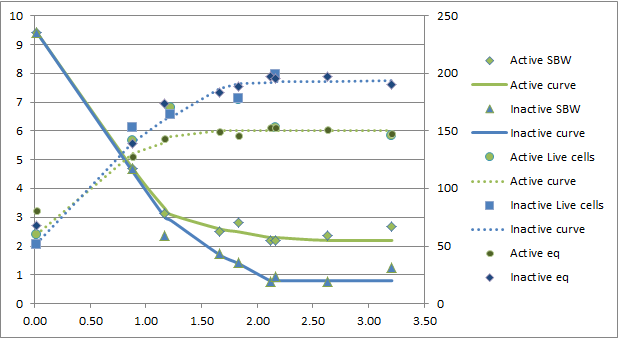 Analysis of the start and finish data. Two15ml test tubes were prepared. Both had a starting gravity of 9.42°P. One was inoculated with 58 million cells taken from an active starter. The second was inoculated with 60 million cells taken a slurry that had been in the refrigerator for one month. Measurements were taken approximately daily and the date and time was recorded with each measurement. These measurements included a refractometer measurement and a cell count with viability staining. At the top of this post is a graph of the results. The "active" description represents cells taken from the active starter, while the "inactive" represents cells taken from the refrigerator. SBW is the sugar by weight. This is the converted refractometer measurement using the equations derived in earlier posts. The "eq" plots are a simple equation to show the relationship between consumed sugar and cells produced. For the active culture this is 10 times the sugar consumed, and for the inactive it is 15 times the sugar consumed. 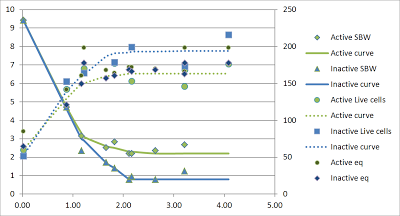 The left axis is percent by weight for the sugar curves. 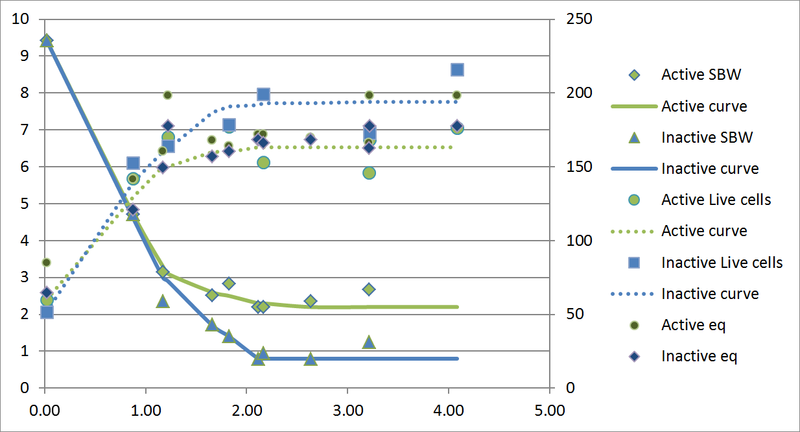 The right axis is million per ml for the cell count curves. Why does the sbw suddenly increase at the end? What you are seeing is likely measurement error. Yeast in suspension makes the line blurry on a refractometer. Also temperature will effect the measurement slightly. How Long Does It Take to Carbonate Beer?